The company owns a financial news site, iMeigu, and a financial social network, Xueqiu. iMeigu, launched in May 2010, has been focusing on U.S. stock market, while Xueqiu also covers Hong Kong stock market and China’s A-share market. 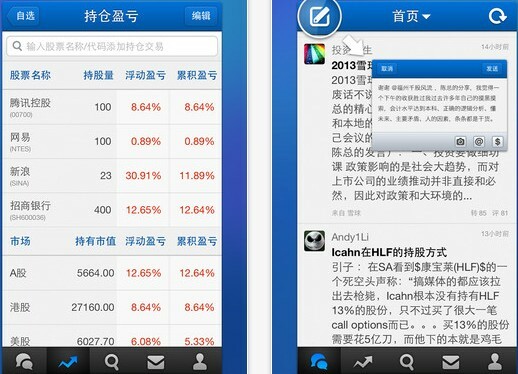 Xueqiu, released in November 2011, doesn’t only has a Facebook’s Newsfeed-like platform, but also offers stock quotes, business news and analysis reports for each stock on those markets. Now being one of the most popular social networks for Chinese investors, it has attracted a large number of professionals in financial sector to contribute financial analysis reports. Xueqiu apps are available for iOS and Android. Established in 2010 by Simon Fang, former deputy editor-in-chief at NetEase’s online media, Snowball received RMB 20 million ($3.2 million) Series A funding from Sequoia China in 2011 and angel investment from Xue Manzi earlier.